PEN America hosts a reading and facilitated discussion around some of the ways Tucson-based members of the literary and media communities can engage with different local activist efforts, including voter participation, civil rights for immigrant and indigenous communities, and other community causes. Writers, advocacy leaders, and others are invited to attend. We’ll brainstorm and facilitate discussion around specific projects, and also discuss funding opportunities the organization has made available to support locally led projects and events. 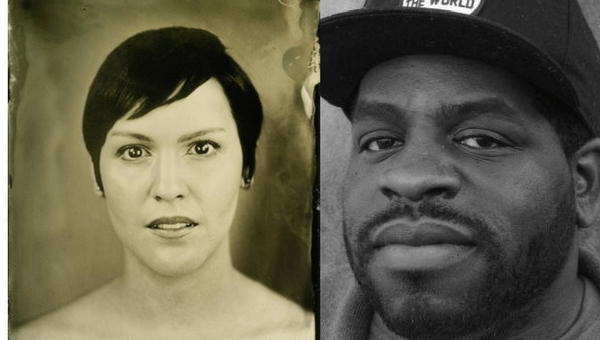 Readers include Eloisa Amezcua and Hanif Abdurraqib. Eloisa Amezcua is an Arizona native. She earned a BA in English from the University of San Diego, where she was the recipient of the Lindsey J. Cropper Award for Creative Writing in Poetry selected by Ilya Kaminsky. In 2014, she completed the MFA program at Emerson College in Boston, MA. She’s received fellowships and scholarships from the MacDowell Colony, the Fine Arts Work Center, Vermont Studio Center, the Bread Loaf Translators’ Conference, the Vermont College of Fine Arts Post-Graduate Workshop, the Minnesota Northwoods Writers Conference, and the NY State Summer Writers Institute. Eloisa’s debut collection, From the Inside Quietly, is the inaugural winner of the Shelterbelt Poetry Prize selected by Ada Limón, forthcoming from Shelterbelt Press. She is the author of three chapbooks: On Not Screaming (Horse Less Press, 2016), Symptoms of Teething, winner of the 2016 Vella Chapbook Award (Paper Nautilus Press, 2017), and Mexicamericana (Porkbelly Press, 2017). She currently lives in Phoenix and is founder and editor-in-chief of The Shallow Ends: A Journal of Poetry. Hanif Abdurraqib is a poet, essayist, and cultural critic from Columbus, Ohio, His poetry has been published in Muzzle, Vinyl, PEN American, and various other journals. His essays and music criticism have been published in The Fader, Pitchfork, The New Yorker, and The New York Times. His first full-length collection, The Crown Ain’t Worth Much, was release in June 2016 from Button Poetry, and was named a finalist for the Eric Hoffer Book prize. With Big Lucks, he released a limited edition chapbook, Vintage Sadness, in summer 2017 (you cannot get it anymore and he is very sorry). His first collection of essays, They Can’t Kill Us Until They Kill Us, is being released in winter 2017 by Two Dollar Radio. He is a Callaloo Creative Writing Fellow, an interviewer at Union Station Magazine, and a poetry editor at Muzzle Magazine. He is a member of the poetry collective Echo Hotel with poet/essayist Eve Ewing. Additionally, he is a columnist at MTV News, where he writes about music, and fights to get Room Raiders back on the air. He thinks poems can change the world, but really wants to talk to you about music, sports, and sneakers.